I would love to show you some finished towels from the last post, but they are still in the process of being hemmed. I decided to hand sew as I much prefer no heavy 'stitch ditch' line. I don't mind doing this and its a nice way to spend time in the evenings while Hub watches hockey play off games. So next post they should be front and centre for you! We had six house viewings here in seven days and then had some out of town company for three days. Happily the viewings conveniently ceased for the company time period but something told me to get cleaned up real fast and so we blitzed the house and mowed lawns. Sure enough, we had three viewings this past weekend! Pays to trust that intuition! Lynnette and hubby were over our way and stopped in as they were heading home. We had a lovely visit and we did some tourist type stuff here where we live and enjoyed a great roast prime rib dinner at home. The best part? When the men folk went to bed and she and I had a late night jammie party and chatted up a storm. They brought gifts! They had toured a meadery (is that a real word?) and gifted us a bottle, plus two lovely fluted glasses! Yum! Its been years since I last had mead so I'm really looking forward to this! Then, I got this ! I'm a lucky lady as its one of Lynnette's Shibori scarves! I'm just thrilled with it! I was cheeky and sent Lynnette home with a new kitchen towel that she was going to have to hem herself before she could use it! So a very busy week as you can see. One thing that Lynnette and I discussed was a small runner or tray cloth I got many years ago. It has a bit of a story to it : I was new to a weavers guild and still very new to weaving when I met Donna. She was bright, very easy to talk with and also the guild's teacher for beginner weaving classes. She was wearing an elegant turban style head scarf and reclining in the shade of a tree at a guild pot luck. You see, she was battling cancer and I didn't know at the time. She made an impression on me and so when I was offered one of her little tray cloths I was very happy to take it home. Now these are not items that will be washed very often; maybe one or twice a year. So now some years have gone by and I have an interesting problem and one I'm sure that Donna would be chuckling at if she was still here. Take a look! Now isn't that strange?! This 'problem' took years to get to this point and its such a lovely undulating twill too. A seismic shift! So what happened? The two of us took a very close look at the warp threads and noticed that the yarn about three inches in starts to be blended with another yarn until it becomes 100% the new yarn. The shrinkage occurs where the new yarn is blended in. So one day long ago, Donna ran short of her warp yarn and substituted another that was either from a different supplier, a different fibre make up, or a different twist. What ever the reason, this is what happens when yarn from two different cones are used! So be sure to either alternate end for end across the entire warp if you are short, or, keep known batch codes of yarns together so you know exactly what you have on hand. Blending end for end means it will do what ever it will do evenly across the warp. I can recall my first project, where money and yarns were a tight commodity, using one end of orlec and one end natural cotton. It was a soft and more wash and wear towel that had great looks but not very absorbant! Hey, I was learning! Meanwhile I'm not sure how to re-hem this tray cloth and I suspect that shrinkage rates will continue at different rates regardless. Your suggestions are welcome! Then I recalled another sad towel I have and showed Lynnette a perfect example of seer sucker. It was a kitchen towel I bought at a sale back in 2004. Its woven in fine 16/2 cottons and in a turned twill. I have two and the second one looks as good as it did when I bought it. The other? not so much! It's gone very fuzzy so I suspect its not cotton but maybe a synthetic. A burn test will confirm this but it means cutting the towel and I'm not ready to do that. It has also tightened up and distorts the other areas that are all cotton and creates seer sucker. This I think is a combination of heat on the white imposter! You know weavers try to achieve this on purpose and it's hard to do. In both cases, the effects took time to occur so put yourself in your customer's shoes wondering what the heck happened! So be sure to keep your yarns labeled, try doing a burn test with known yarns to prepare for the day when you get a great bargain at the right price... and don't know what the heck it is! Meanwhile, Calli tells me to sew those hems faster and no slacking off! Oh, and another cookie please? Edit: I think the white fuzzy yarn might be an ultra fine wool! Now that would make sense! In Which We Actually Weave Something! This project has been a long time coming. I have woven it before and chose it again knowing it was what I call 'mindless' zen weaving, great for listening to music or podcasts while you treadle one to eight, and one to eight again and again, occasionally measuring for length or mix matching colours for the borders. No, this warp has sat patiently due my bad back and then again while I worked on a new seat to weave from. Rear mounted treadles make for lighter work but the whole leg must depress down almost to the floor which in turn pulls on lower back muscles. So it waited and rather patiently too. 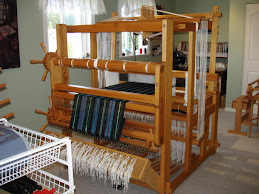 I even thought about selling this loom (which I really do not want to do) but now with my new chair, and well rested back, I'm weaving there again. Mind you I'm not breaking any speed records but I don't want another three month time out again for a cranky back if I can help it. I'm not certain when the warp was wound but this warp was already on the loom when Lynnette came for a visit last September. Yup, that long. in my defense, I did keep my Louet Spring, 'Lilibet' busy as best I could! It would seem my planning last fall worked out nicely for spring! They are very Easter like, although I'm even late for that now! White, plum, celery green, salmon pink and a yellow. All are from Brassards in Quebec. I wound them in one inch bouts and beamed them onto the sectional beam in my hybrid method. It looks neat all wound on the back beam! The warp is twenty five inches wide. I like big towels. I isolate the row being worked on and you can see everything is clearly marked so I know where I am at all times. Here's the reason why! The long cords hanging at the bottom are for shafts 9 through 12 as they are not being used in this 8 shaft draft. The other cords are pulled and clipped depending on either upper or lower shaft (or x's or o's) on the tie up grid. It takes me roughly ten minutes to pull the tie up above. Now that's a vast improvement over lying on the floor with the foot beam in the way and craning my neck up to do fiddly tie up's for lord knows how long. As you can see in the picture above, I tied on and have my temple ready to go. I tried out some different colours for wefts as I wove in my header. I'm weaving six inches for hem allowance, plus a short section of the towel that is plain solid colour, and then do a coloured border which is approximately two and half inches, then weave seventeen inches for the main body of the towel and then reverse my start. This adds up to thirty four inches per towel. I weave a separation between towels using scrap yarn of one repeat and then it starts all over again. In my next post, we'll be working on finishing and final show and tell.... in between showing our house, housework, looking for another home and even having company for a few days! I should wear my Super Woman cape but I'm too tired to look for it!